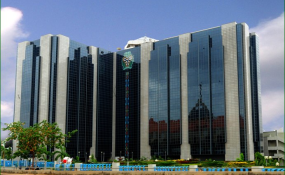 The Central Bank of Nigeria (CBN) said on Wednesday that the country's Balance of Payment improved by a surplus of $2.80 million in the fourth quarter 2018, from $4.54 million recorded in the third quarter of same year. The CBN disclosed this in a report titled: "Brief on Balance of Payments Statistics Q4'18" posted on its website. The bank said: "The provisional Balance of Payments (BOP) estimates for Q4 2018 showed a significant improvement in the BOP outcome. "The overall balance of payments recorded a surplus of $2.80 million compared to a huge deficit of $4,542.08 million and a surplus of $6,180.40 million recorded in the preceding quarter and corresponding period of 2017, respectively. "The current account balance (CAB) improved from a deficit of $1,544.41 million in Q3 2018 to a surplus of $1,104.57 million in Q4 2018. "The financial account balance indicated a net acquisition of financial assets of $2,327.91 million in the review period as against a net incurrence of financial liabilities of $4,615.17 million recorded in the preceding period." The bank also said that the current account indicated a positive outcome during the period under review. According to the apex bank, the country recorded a surplus of $1,104.57 million as against a deficit of $1,544.41 million and a surplus of US$3,657.18 million in the previous quarter and corresponding period of 2017, respectively. "This development was largely attributable to the decrease in imports and payments on income. "On goods account, the CBN said the surplus increased significantly to $6,793.60 million in fourth quarter 2018 from surpluses of $3,759.88 million in the preceding quarter and $5,472.74 million recorded in the corresponding period. "Export earnings rose by 2.8 per cent to $16,655.49 million in Q4 2018 when compared with Q3 2018. It also indicated an increase of about 27.6 per cent when compared to corresponding Period of 2017. "Earnings from crude oil and gas, which accounted for 93.8 per cent of total export earnings during the review period, increased by 2.1 per cent to $15,620.90 million in Q4 2018 when compared with the preceding quarter. "Earnings from non-oil and electricity exports increased by 15.0 per cent to $1034.59 million in Q4 2018 when compared with the preceding quarter."